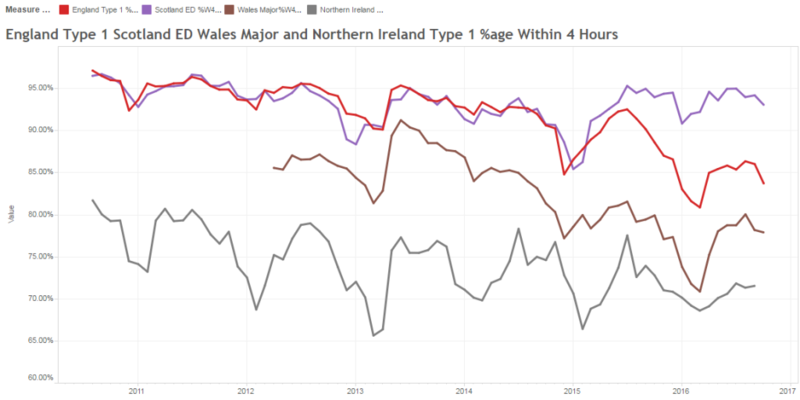 … and that is what we are seeing in the UK health and social care system … using the thermometer of A&E 4-hour performance. England is the red line. The chart shows that this is not a sudden change, it has been developing over quite a long period of time … so why does it feel like an unpleasant surprise? One reason may be that NHS England is using performance management techniques that were out of date in the 1980’s and are obsolete in the 2010’s! Let me show you what I mean. This is a snapshot from the NHS England Board Minutes for November 2016. RAG stands for Red-Amber-Green and what we want to see on a Risk Assessment is Green for the most important stuff like safety, flow, quality and affordability. We are not seeing that. We are seeing Red/Amber for all of them. It is an evolving catastrophe. 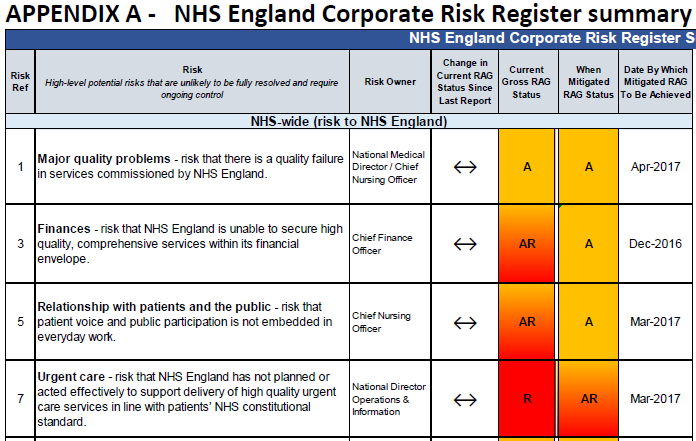 A risk RAG chart is an obsolete performance management tool. This demonstrates the usual mix of single point aggregates for the most recent month (October 2016); an arbitrary target (4 hours) used as a threshold to decide failure/not failure; two-point comparisons (October 2016 versus October 2015); and a sprinkling of ratios. Not a single time-series chart in sight. No pictures that tell a story. Click here for the full document (which does also include some very sensible plans to maintain hospital flow through the bank holiday period). The risk of this way of presenting system performance data is that it is a minefield of intuitive traps for the unwary. Invisible pitfalls that can lead to invalid conclusions, unwise decisions, potentially ineffective and/or counter-productive actions, and failure to improve. These methods are risky and that is why they should be obsolete. And if NHSE is using obsolete tools than what hope do CCGs and Trusts have? Much better tools have been designed. Tools that are used by organisations that are innovative, resilient, commercially successful and that deliver safety, on-time delivery, quality and value for money. At the same time. And they are obsolete outside the NHS because in the competitive context of the dog-eat-dog real world, organisations do not survive if they do not innovate, improve and learn as fast as their competitors. They do not have the luxury of being shielded from reality by having a central tax-funded monopoly! And please do not misinterpret my message here; I am a 100% raving fan of the NHS ethos of “available to all and free at the point of delivery” and an NHS that is funded centrally and fairly. That is not my issue. My issue is the continued use of obsolete performance management tools in the NHS. Q: So what are the alternatives? What do the successful commercial organisations use instead? SBCs are pictures of how the system is behaving over time – pictures that tell a story – pictures that have meaning – pictures that we can use to diagnose, design and deliver a better outcome than the one we are heading towards. Pictures like the A&E performance-over-time chart above. Click here for more on how and why. Therefore, if the DoH, NHSE, NHSI, STPs, CCGs and Trust Boards want to achieve their stated visions and missions then the writing-on-the-wall says that they will need to muster some humility and learn how successful organisations do this. This is not a comfortable message to hear and it is easier to be defensive than receptive. The NHS has to change if it wants to survive and continue serve the people who pay the salaries. And time is running out. Continuing as we are is not an option. Complaining and blaming are not options. Doing nothing is not an option. Learning is the only option. Anyone can learn to use system behaviour charts. No one needs to rely on averages, two-point comparisons, ratios, targets, and the combination of failure-metrics and us-versus-them-benchmarking that leads to the chronic mediocrity trap. And there is hope for those with enough hunger, humility and who are prepared to do the hard-work of developing their personal, team, department and organisational capability to use better management methods. Apollo 13 is a true story. The catastrophe was averted. The astronauts were brought home safely. The film retells the story of how that miracle was achieved. Perhaps watching the whole film would be somewhere to start, because it holds many valuable lessons for us all – lessons on how effective teams behave.